Dr. Zoi Vlamaki completed Bachelors in Surgery and Medicine & Master Degree with specialization in General Surgery. Dr. Zoi has completed her CCST in General Surgery, laparoscopic Surgery, and has been awarded European and Greek License of General Surgery. Dr. Zoi is a Fellow of Royal College of Surgeons, England (FRCS). She has certification in ALS (Advanced Life Support) & ALTS (Advanced Trauma Life Support), and is American Board Certified Doctor in wellbeing and Antiaging Medicine. Dr. Zoi Vlamaki has extensive experience in the fields of General Surgery, Breast Surgery and Aesthetics. 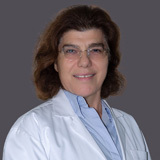 She has 19 years of experience as a Consultant, Breast and General Surgery in various prominent and tertiary care hospitals, mainly in the United Kingdom and Greece. Her latest experience was in Whittington Hospital, London as a Consultant, Breast Surgeon. Dr. Zoi Vlamaki’s areas of expertise are Breast diseases, Benign and Malignant. Breast cancer diagnosis and treatments; breast Onco-Plastic reconstructive Surgery, Preventive and screening of breast diseases, Diagnostic endoscopy of the Breast Milk Ducts and Screening for family history of breast cancer. Dr. Zoi Vlamaki has completed numerous international courses including Masterclass Breast Reconstruction, Onco-Plastic & Reconstructive Breast Surgery (ORBS). Paris Breast Rendez-vous, for oncoplatic reconstructive and aesthetic breast surgery. She has attended numerous international conferences for minimal invasive surgery and has several research and prostrations to her name. Dr. Zoi is an accredit member of several international associations including, GMC- Specialist Full Registration, FRCSEng - Fellow of Royal College of Surgeons- England, GMC Greece, BMA, ABS, BASO, ESSO, ASBS- American Society of Breast Surgeons, ASCO- American Society of Clinical Oncology, IRCAD, FRANCE, Greek Society of Breast Surgery, EHS, European Hernia Society, Greek Society of Laparoscopic Surgery, European Association of Laparoscopic Surgery, Member of International Surgical Society, American Association for Laser Surgery and Medicine and minimal invasive Surgery, EURAMI and Air ambulance Doctors. Dr. Zoi speaks English and Greek.